Flight controllers have decided not to add a fourth spacewalk to the shuttle Discovery's mission to replace a nitrogen tank in the International Space Station's ammonia coolant system, concluding the system can safely operate for an extended period despite a stuck valve preventing normal pressurization. Astronaut Megan McArthur radioed the news to shuttle commander Alan Poindexter just after the crew woke up around 12:21 a.m. EDT. "We have some big picture words for you on the plan this morning," she called from mission control. "The decision has been made to not perform a fourth EVA on this mission. Analysis shows the current ATA (ammonia tank assembly) config is OK for an extended period. Once everybody's awake and you've had some coffee, you can get with the ISS crew and call down on the big loop to the ISS MCC (mission control center) and they'll give you some more detailed words." "OK, Megan, that sounds great, thanks a lot," Poindexter replied. "Again, we appreciate all the extra effort that went into quickly looking at that option. We're glad the station will be fine without the extra EVA here for a little bit. Thanks a lot." A fourth spacewalk would have required a one-day mission extension and delayed Discovery's undocking from Saturday to Sunday. As it now stands, the Discovery astronauts will press ahead with their normal flight plan, undock on Saturday and land back at the Kennedy Space Center early Monday. The major item on the shuttle crew's agenda Thursday was wrapping up equipment transfers between the station and the Leonardo cargo module that was carried up aboard Discovery and attached to the lab complex the day after docking. The Italian-built module was launched with more than 17,000 pounds of equipment and supplies for the space station. For its return, it will be packed with nearly 11,000 pounds of equipment, trash and no-longer-needed material. 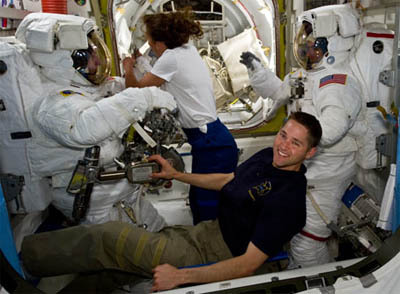 The astronauts plan to leave the cargo module for the last time around 3 a.m. Around 7:30 a.m., astronaut Stephanie Wilson and shuttle pilot James Dutton will grapple the module with the station's robot arm. A little more than an hour later, the common berthing mechanisms will disengage and Wilson will move the cargo module back to the shuttle's cargo bay. The module should be locked in place by around 10 a.m. The astronauts are scheduled to go to bed around 4:20 p.m., just after President Barack Obama delivers a major space policy speech at the Kennedy Space Center. During an orbital news conference Wednesday, Poindexter said the crew was following news coverage of the president's visit but had not made plans to watch any of the proceedings. At the Johnson Space Center in Houston Wednesday, engineers spent the day carrying out a detailed analysis to determine whether a fourth spacewalk should be added to Discovery's mission to replace a nitrogen tank in the space station's external cooling system. One of the primary goals of Discovery's mission was to replace one of two ammonia coolant tanks on the station's main power truss. Before staging the first of three spacewalks to swap out the tanks, flight controllers sent commands to close a nitrogen pressurization vent valve. After the new tank was installed, engineers attempted to reopen the nitrogen valve but it failed to respond and appears to be stuck in the closed position. The nitrogen is used in a bellows system to maintain the proper pressure when the ammonia coolant expands due to solar heating and contracts due to cooling. Solar heating currently is increasing as the angle between the sun and the plane of the station's orbit changes. Without the nitrogen pressurization system, engineers worried there was a chance coolant loop A could be damaged due to the ammonia's unchecked expansion. Before that happens, flight controllers could simply shut down electrical systems and deactivate coolant loop A. But that last-resort option would cripple the space station. As it turned out, an exhaustive analysis showed coolant loop A can handle the expected temperature increases over the next few weeks even without normal pressurization. That will allow the station crew to defer swapping out the nitrogen tank until a quieter period when it will have less impact on station operations. "We could possibly do a (station crew) spacewalk between space shuttle flights, so maybe we go do a spacewalk before STS-132 (the next flight) that's coming up in May," said Flight Director Ed Van Cise. "Maybe there's enough flexibility for us to do it after STS-132, maybe the engineers and the program managers determine the best thing to do is actually try to do something during the STS-132 mission because there are more people, more resources available."